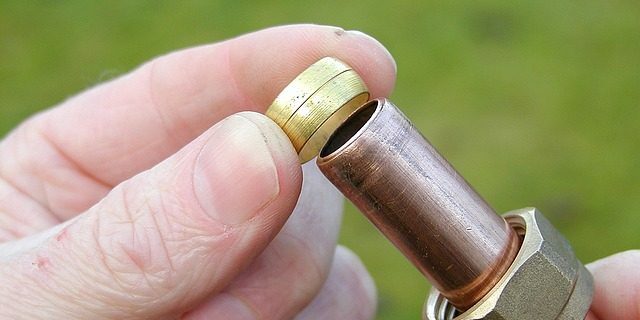 If you’ve ever needed to solder a fitting onto copper pipe, then you know that you need to drain the water out of the pipe so the solder melts properly. While this sounds simple enough, draining water out of a vertical pipe can be tricky. Detach the spray nozzle from a spray bottle or an empty bottle of cleaning solution. The nozzle should have a thin, flexible tube that extends below the screw cap. This tube carries whatever contents are in the spray container through the nozzle, and you can use it to quickly empty a vertical pipe. Simply insert the flexible tube from the spray nozzle into the copper pipe that you wish to drain. Have a small basin or container nearby to catch the water, and then simply squeeze to draw the water out of the pipe, through the spray nozzle and into the wastewater container. Instead of fumbling with clunky draining methods, a simple spray nozzle can help you drain a vertical copper pipe easily in minutes.